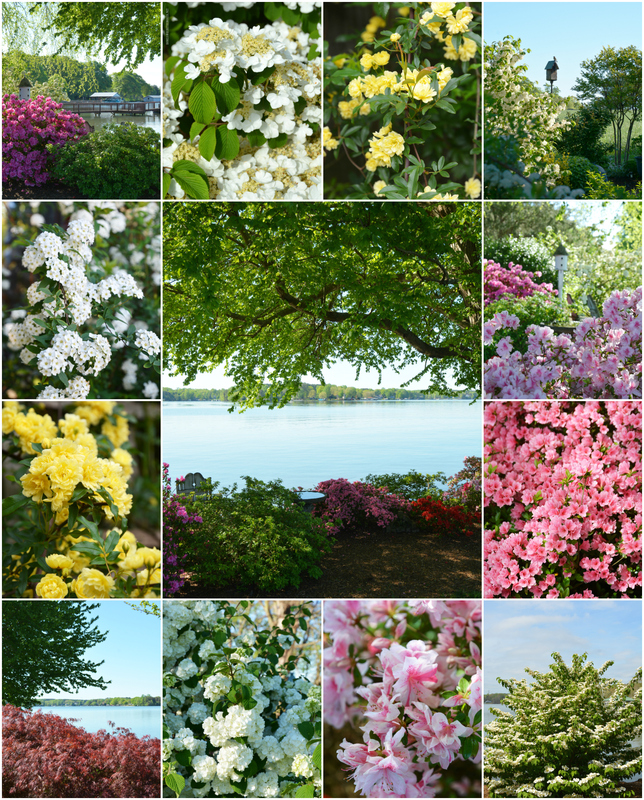 Welcome back everyone to A Southern Blossom, as promised I would like to continue my tour with my dinning room. I almost always keep the table set for a party of six with dishes and the whole nine yards...... Except during the holidays when I ask (force) Mr. SB to insert the extension for seating for eight. The dishes are from TJ Maxx, and let me tell you I couldn't load that cart up fast enough. The napkins are from Target. The centerpiece is a collection of candles and a few starfish nestled in a crate (another lovely find from Marshalls). I don't know about you but I find that I have moods (color moods that is) and right now I'm in love with the color yellow, as you may have noticed from looking at this tablescape. Just a little twine added to the candles to create some texture. I love house plants and have them everywhere. The candle holders and the yellow candles are from Hobby Lobby. In this photo you can see a cute burlap votive holder with a bee design. Once again thank you for stopping by, I hope you enjoyed the dinning room tour, and thanks to everyone for all the lovely comments! I really like your yellow table. Everything is so pretty and I love the centerpiece. Yellow is a color that comes and goes for me depending on the shade, but the shade you've used is a winner in my book. Hi there, Karen! This is my 1st visit to your blog via Tablescape Thursday. 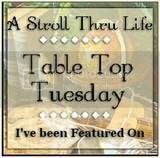 I see you are relatively new to the tablescape blogging scene, and I welcome you! Fun, isn't it? There are so many great ideas floating around out there!!! Your dining room is really nice, and I really like the wall color and lighting fixture! You did a wonderful job with your tablescape. The yellow works well in the room. I like that you added a live plant to the mix with your centerpiece. Beautiful TJ Maxx dishes, too! I never saw that pattern here in the Kansas City, MO area!!! I'm glad to read that you have a love affair going with your house. After all, there's no place like home! (Spoken like a true Midwesterner, huh?) 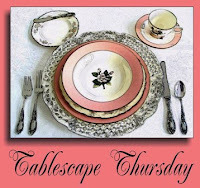 :-) Have a great weekend, and I look forward to seeing more tablescapes from you! Your dining room is a dream dining room for me. How I wish I have such a beautiful and a spacious dining room. Beautiful and your settings? What can anyone, ask for more? WOW! That's all I have to say! How amazing is your dining room. I thought the picture was the inspiration picture, it's so pretty! Thank you so much for your comment, I have been following your blog for several months and always find your posts extremely inspiring! The post that I loved the most was the one about waking up the house. On my days off I still wake up early and love to open the shutters from one room to the next, that's my me time. This is my favorite post too Karen. I do the same thing! Love Thistlewood Farm, and now I'm enjoying your blog too! Isn't it cool when one of the blogs you love comments on yours! PS (Can you do a PS on a blog comment?) I bought these dishes at Homegoods and the pattern washed off on mine. Have you had this issue with yours? If not, don't put them in the dishwasher! Lovely setting - the yellow is so cheery! But what really caught my eye is the color of your dining room - love it!! Thank you Patti for your kind remarks. Congrats on your new blog - love new bloggers!! (You forgot the U in Southern in your header) Your house is lovely and so inviting - look forward to seeing more! I saw this post over on Hometalk and I had to stop by to say thank you so much! What a great project and you have such an incredible eye for design. Your dining room is beautiful! Would you please share your paint color? Thanks so much! Hi Karen! Your dining room is gorgeous. I love your table settings. What a stunning dining room and table! I think it is very gracious to go into a home that has the table set! I love your centerpiece!!! Just when I'm ready to embrace a neutral color scheme, I see a home like yours and I question myself. Just beautiful! Whoa! I LOVE those dishes! The whole room is beautiful, but if I knew where you lived I would have to steal those dishes!